Lori grew up in Tucson, the daughter of a handyman and a kindergarten schoolteacher, but from the age of five she spent her summers with her great-aunt in Lincoln. There, to keep her occupied, she was given the job of touching up the antiques that needed to be repainted. For diversion, Lori would sometimes let her imagination take over and paint designs and scenes on old milk cans and coal scuttles. One day a customer purchased one and, according to Lori, “That gave me my start in the art world. 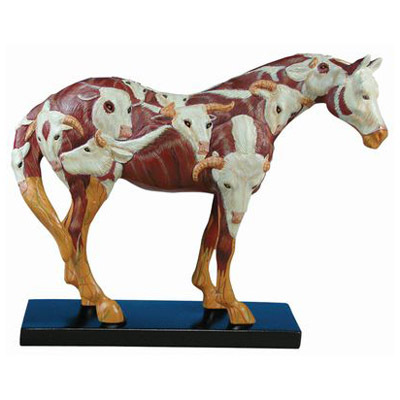 Lori’s extraordinary life-size Painted Pony - “CowPony” – was a hit, not just for the clever design – a sorrel hiding among a herd of Herefords – but for the way she gave every animal a distinct expression, and personality. 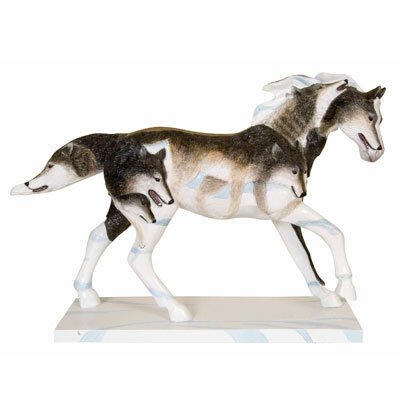 When it was offered at auction, it sold to the Booth Museum of Western Art in Cartersville, Georgia for $50,000, the highest price of any Painted Pony, raising big money for a group of charities. Lori followed up her success with another sensational Painted Pony – “Year of the Horse” – that also brought top dollar at our second End of the Trail auction. 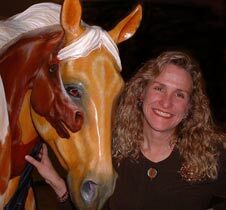 Painting ponies that sell for tens of thousands of dollars is a far cry from painting a milk can. Hearing Lori talk, one gets the feeling that the world and everything in it is this gal’s canvas. 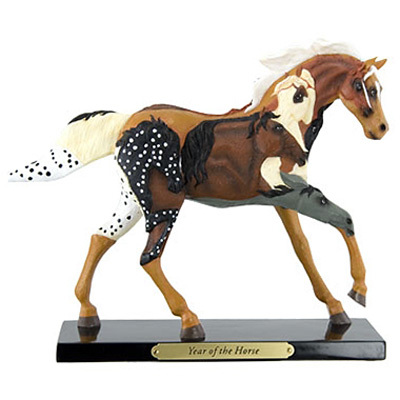 CowPony, a collectible figurine inspired by Lori Musil's original Pony "CowPony". 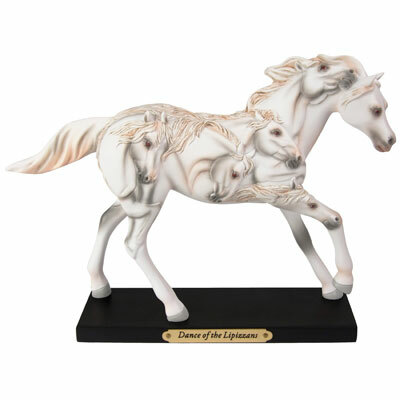 Year of the Horse , a collectible figurine inspired by Lori Musil's original Pony "Year of the Horse "
Cerrillos, New Mexico… which is not much more than a ghost town a half-hour southeast of Santa Fe. My mom, who, to keep me out of trouble, would sit me down in a chair and put a piece of paper in front of me and tell me to sit still and draw. Plus, artists like James Bama, an excellent artist of the West, and Bev Doolittle, who also loves to hide things in pictures too. Jewel tones: ruby, emerald, sapphire, amber. Laughter is the best medicine. Pick your battles. Will Rogers. He was the consummate humorist. He had a way of making everyone laugh at themselves, and boy that man could throw a rope.